Introduction; Financial Reporting including International Standards; Auditing and Governance; Management Accounting; Business Mathematics; Budgeting Techniques. 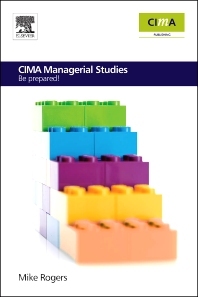 Be prepared for your CIMA Managerial Level Studies CIMA Managerial Studies brings you quickly and thoroughly up to speed for your Managerial Level studies by covering the key components of the CIMA Certificate in Business Accounting. CIMA tutor and author, Mike Rogers, explores the areas that are most problematic for students who are embarking on Managerial Level studies without having first completed the CIMA Certificate in Business Accounting and provides the relevant information. With summaries of key theory and a self-test Question and Answer section at the end of each chapter, this book is an essential addition to the CIMA Official Learning systems and Exam Practice Kits. Check out Mike Rogers’ blog (CIMAmanagerialstudies.wordpress.com), for frequently updated information on the accounting and audit aspects of your managerial studies including changes to current International Financial Reporting Standards.